Winter is a time when kids can get a little antsy from being stuck inside day after day due to cold and snow. If you are looking for a quiet-time activity that can keep your kids fascinated during the long indoor hours, worry not! 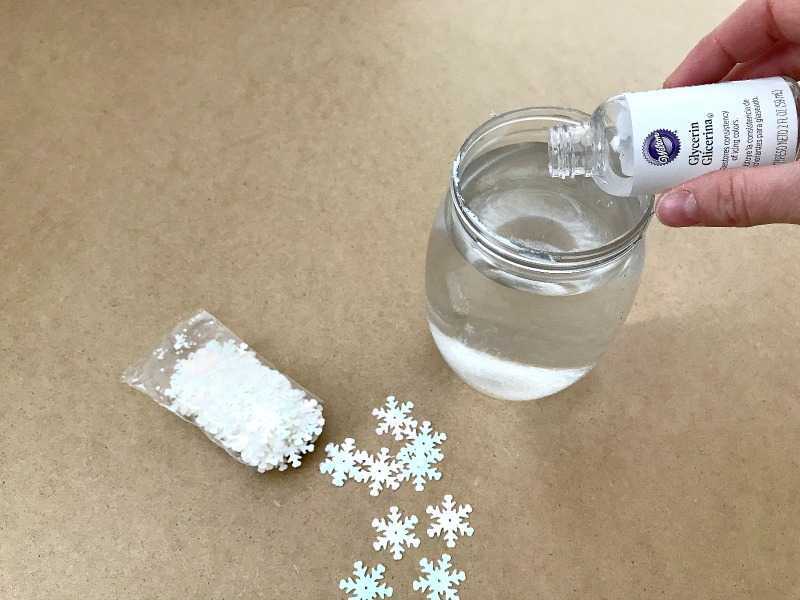 This winter calming bottle is a cool sensory activity that is sure to capture their attention, with shimmering snowflakes and shiny glitter falling like snow, this calming bottle is sure to be a winter sensation! Calming bottles, also known as sensory bottles, are a way to immerse children in a calming sensory experience, in bottle form. Calming bottles can be filled with all sorts of colorful liquids and objects; some of the most popular bottles include colored water and glitter. Calming bottles can be found in many classrooms and preschools; special needs children in particular love calming bottles, a fact I learned when I was working as a speech-language pathologist in schools. But calming bottles aren’t only for special needs children! High-energy children and children who have difficulty focusing can also benefit from sensory bottles. 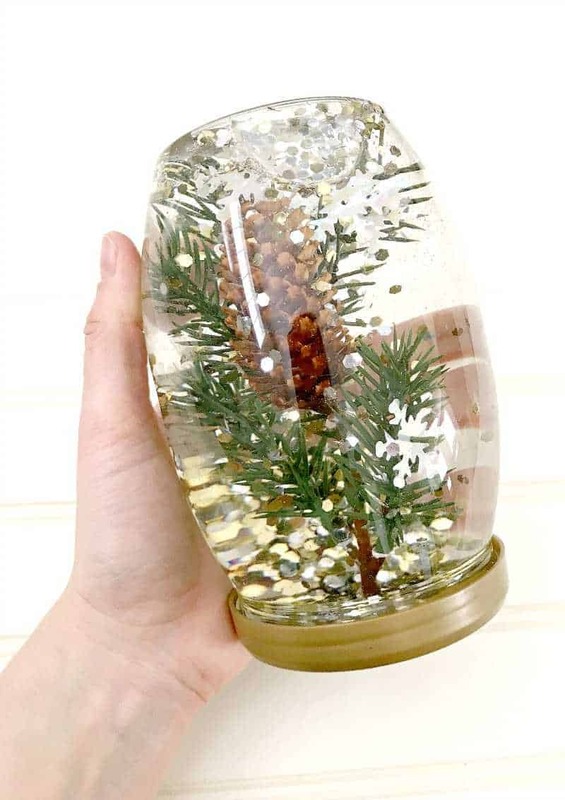 I was inspired when I came across this Falling Leaves sensory bottle on Pinterest and realized I had all the items I would need To make my own winter sensory bottle just lying around. I decided to use chunky glitter and iridescent snowflakes to create a calming winter snowfall effect in this winter calming bottle. After all, what could be more calming than watching snow fall silently in the winter? 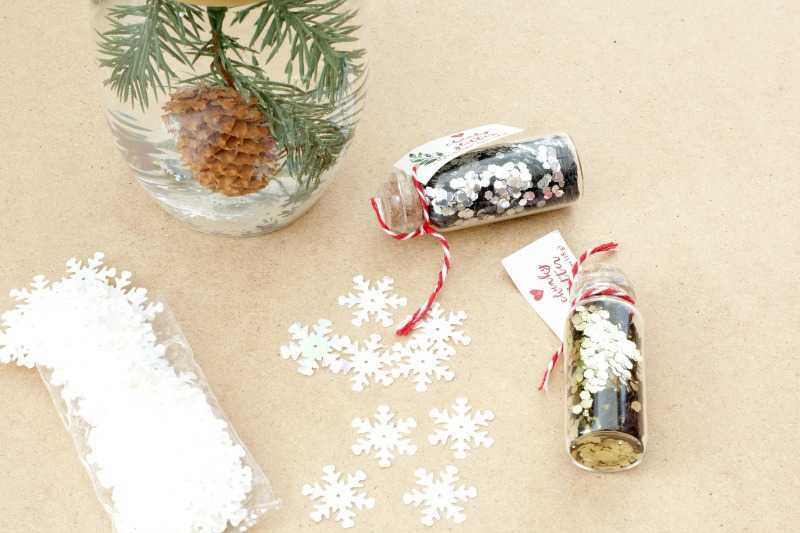 Read on to see all the steps to make your very own winter calming bottle, in less than 30 minutes. You can use any clear bottle or jar, but if you have very small children you probably want to use plastic over glass. I used a Heinz mayonnaise bottle for this craft. 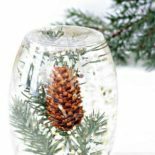 As for the pine branch, you can either use a real one or go and trim one from an evergreen. If you use real, make sure to gently wash any dirt or debris off of the branch — you don’t want it floating in the water! The glycerin is what will make the glitter fall slowly in the bottle. Water amount will vary depending on the size of your jar. I used about 3 1/2 cups for my winter calming jar. 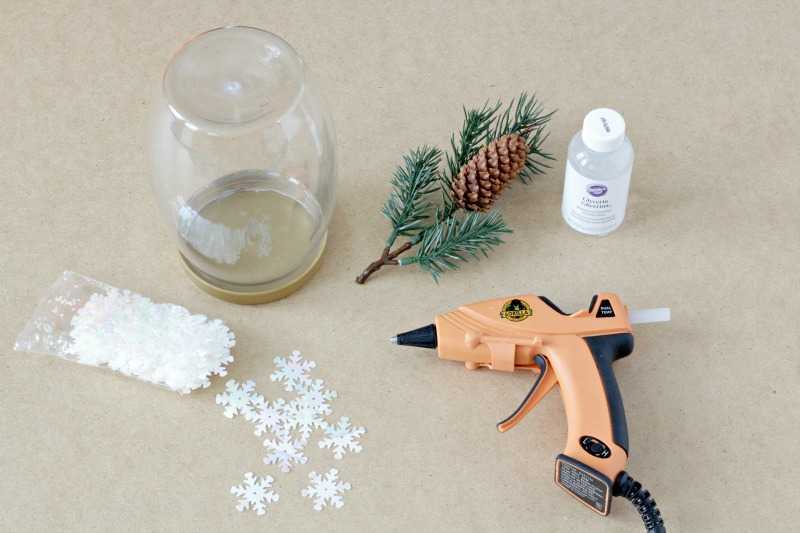 Gather your supplies and plug in your hot glue gun. Protect the surface of your work area from the glue by using a paper towel or parchment paper to catch drips of hot glue. Place the branch inside the bottle and check the length. Trim off any excess length at the bottom end of the branch. Set aside. 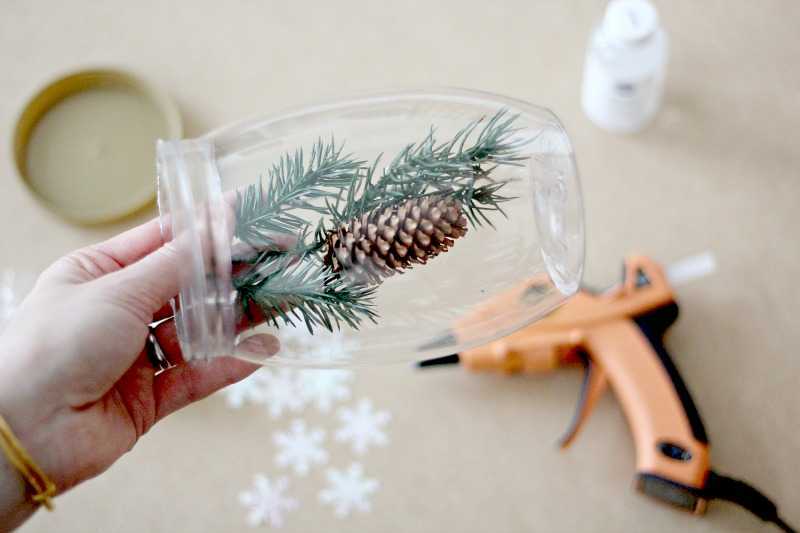 Use the hot glue gun to glue the branch firmly in place on the inside of the bottle’s lid. Hold it in place until completely dry, otherwise, it may fall to the side. You will need to hold it for 5 minutes or so, after which it will stand straight up on its own after having dried completely. 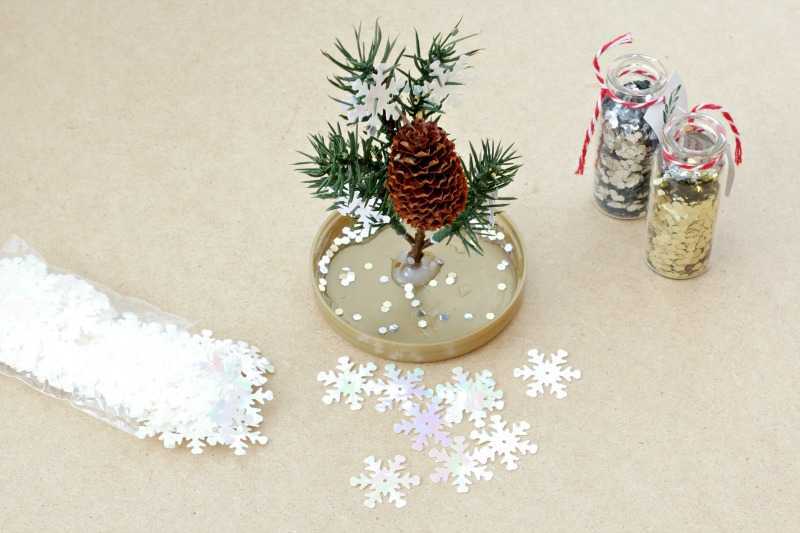 Take a few of the white snowflakes and glue them onto the pine branch. If the snowflakes you use have holes like mine, that makes a great place to pin them on for gluing. 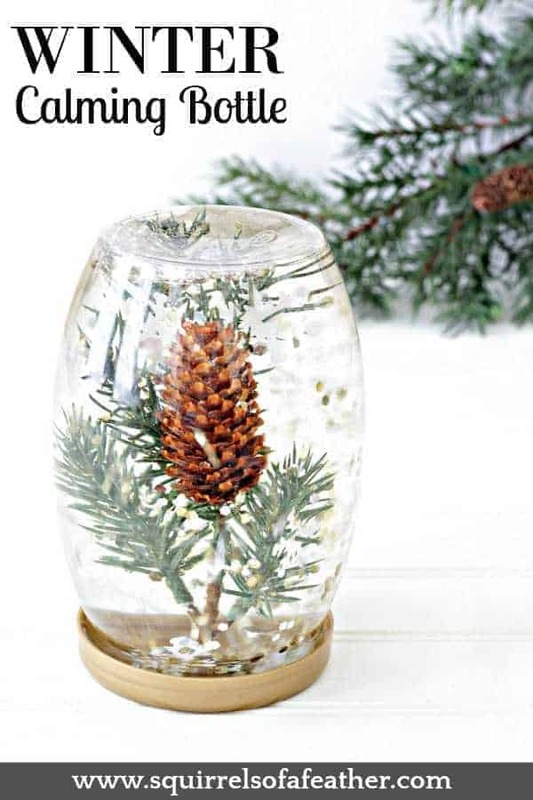 Take the lid with the branch glued to it and double check the fit of the branch inside the bottle. Now is the time to do any additional trimming or adjustments, before moving on. Fill the base of the bottle up with water and then add the glycerin. Use 1/4 cup of glycerin for 1-3 cups of water and 1/2 for 4+ cups. 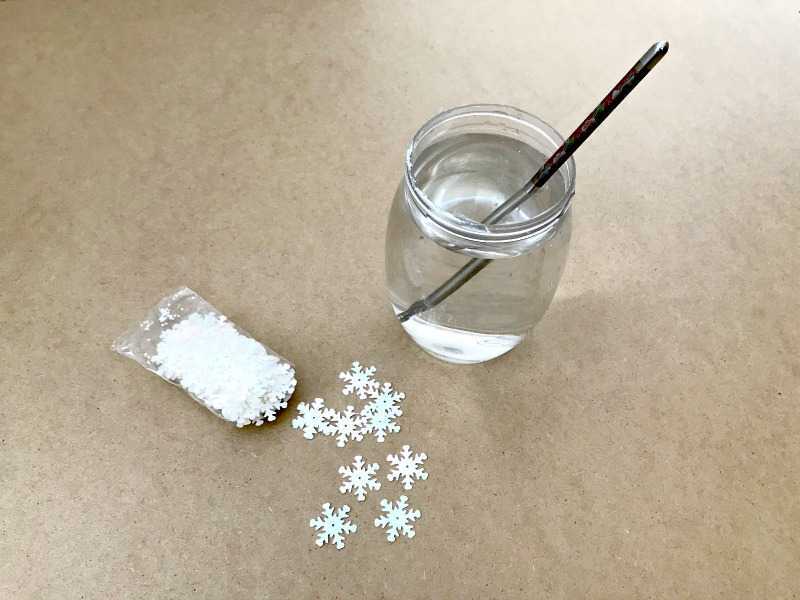 Use a spoon or chopstick to stir the glycerin into the water until combined. You should be left with a nice, clear mixture. Add a little more water if necessary afterwards to fill the liquid nearly to the very top of the bottle. 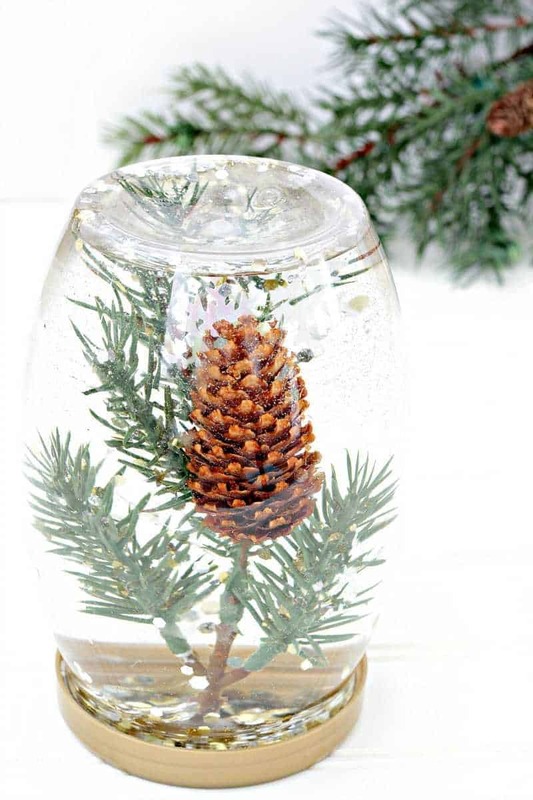 I know you see the branch inside the jar — ignore that! This is the time to place a gernous scoop of gold and slver giltter at the bottom of the jar. I estimate I used about 1/2 tablespoon of each on the bottom of my calming bottle. After you have added the glitter, you are ready to close the lid. Close it and make sure you are happy with the results before gluing the lid of the bottle in place. Trust me, you don’t want curious fingers opening up the bottle and spilling this all over the house! 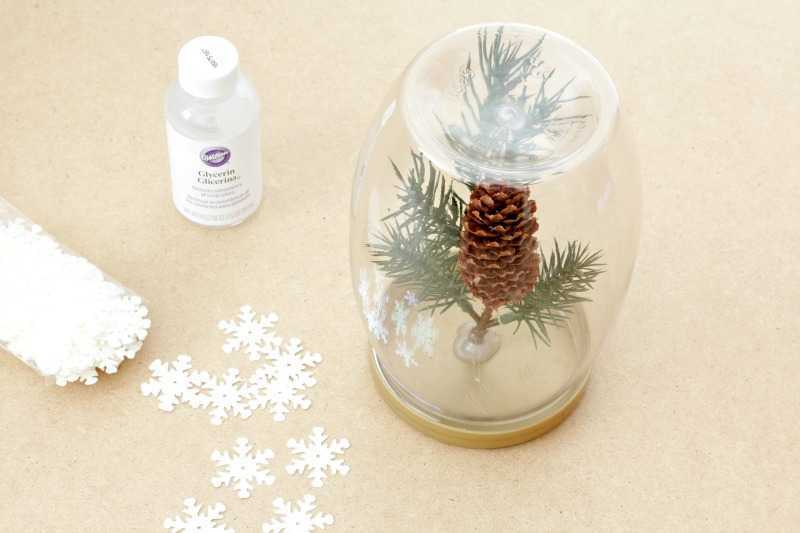 After the glue on the lid is dry, you can present your child with their very own calming bottle to enjoy the sensory affect of winter snowfall over and over again. « Ebates Review: Is Ebates a Scam or Can You Really Get Paid to Shop? This is very cool! I bet Ryker would LOVE this! Sharing with Nika, and perhaps we’ll get one together! Pinning, dear heart! Thanks Julie, I hope Ryker likes it if you decide to make it! I love this idea, especially for those cold days when we all get cabin fever! My kids will enjoy this. I had never thought about the calming effect that a “party in a jar” like this could have. So many options to customize, too. Pinning it! 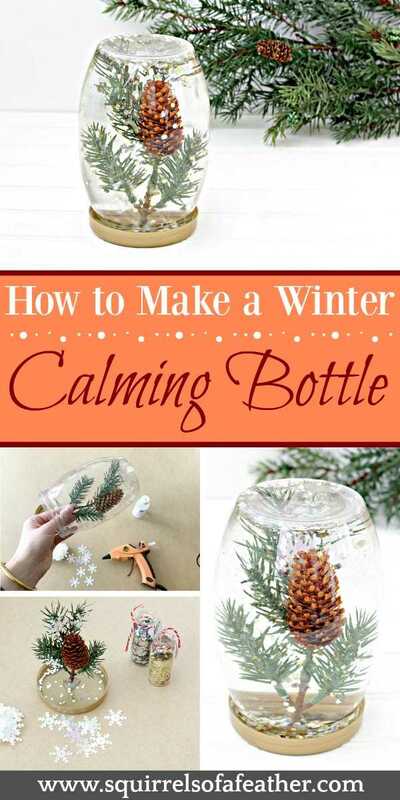 Calming bottles are so much fun and there are so many possibilities. Thanks for pinning! I love this! I think my little grands will too. 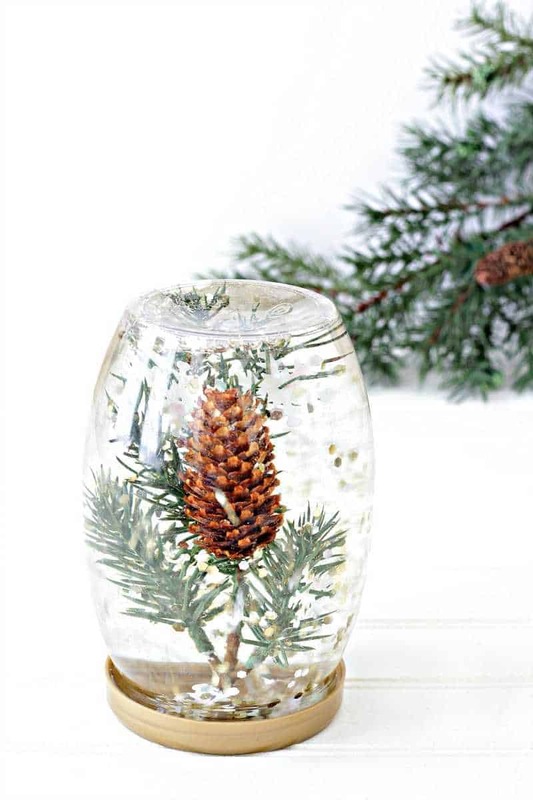 As many times as I’ve looked at snow globes, I’ve never thought about the calming effect they can have, but I can totally see how that could work. Pinning! This is such an awesome idea and also doubles as home decor too! Can’t wait to try this out with my 3yo. He’s definitely a high energy kid so I hope this has a calming effect on him! This is really cute and also pretty! You could also use it as a decoration for Christmas. Great idea, Christene! I think it would definitely make a nice winter decor shelf piece. BEAUTIFUL! i THINK ADULTS WOULD LIKE THESE, TOO! So pretty and so simple! I love it! Yay! Thanks, Renee, I know how you love simple!